Divine Organics Raw Organic Cacao Paste / Liquor, 16 Oz Cocoa Paste by Divine Organics at Good Time Donuts. MPN: TRTAZI11A. Hurry! Limited time offer. Offer valid only while supplies last. THE Antioxidant Powerhouse Cacao is one of nature's most abundant sources of antioxidants, the natural chemicals that prevent or slow cell damage. THE Antioxidant Powerhouse Cacao is one of nature's most abundant sources of antioxidants, the natural chemicals that prevent or slow cell damage. Flavonoids in cacao are good for the heart. Resveratrol helps protect the nervous system. Cacao is a rich source of magnesium, iron, potassium, calcium, zinc, copper, manganese and fiber. Indulge in the Food of the Gods Theobroma, botanical name for the cacao bean tree, translates as food of the gods, native to tropics of the Americas, with medicinal qualities revered for centuries. Divine Organics Cacao Nibs are the Arriba Nacional variety, known for its aromatic, rich flavor without bitterness. Farmed Sustainably, Processed Naturally Sourced from small farms in Ecuador. Natural methods without solvents or chemicals ensure all nutrients remain intact. Boost Energy and Happiness The theobromine in cacao slowly releases energy, effective and less intense than caffeine. Satisfaction Guarantee At Divine Organics we stand behind our product and provide a Better-Than-Money-Back, no questions asked 100% Guarantee. If you are not 100% satisfied, contact us immediately and you will get a full refund. 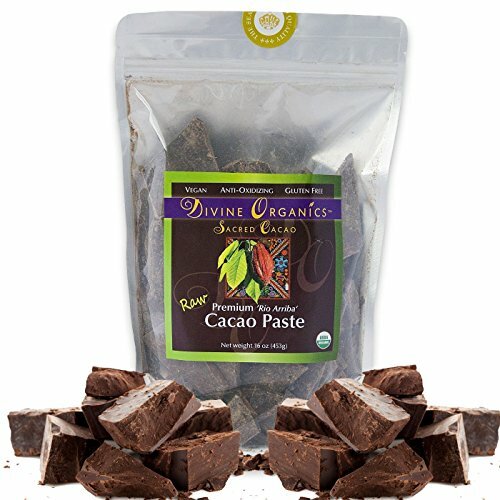 ✔ USDA Certified Organic Cacao: Vegan, non-GMO, kosher, gluten-free, dairy-free, soya-free, raw. Highest quality cacao beans grown in Ecuador. ✔ BAKING CHOCOLATE. Ideal for home-made recipes for baking, truffles, pies and cakes. ✔ ANTIOXIDANT POWERHOUSE: This Super Food Is rich in magnesium, high in protein, with a significant amount of fiber, and contains only natural good fat like those in avocado, coconut and nuts. No additives, fillers, sugars or anything artificial or processed. ✔ RESEALABLE/RECLOSABLE BAGS preserve the freshness to make the product last longer. These bags seal well and keep the pure raw cacao aroma intact. ✔ 60-DAY BETTER-THAN-MONEY-BACK GUARANTEE! Order now with peace of mind. If you are not 100% satisfied, tell us within 60 days of purchase and we'll give you a full refund, no questions asked! 100% CUSTOMER SATISFACTION GUARANTEED! See product description below for more information. If you have any questions about this product by Divine Organics, contact us by completing and submitting the form below. If you are looking for a specif part number, please include it with your message.